Ultimately it means nothing, yet it means so much more. Both the New Jersey Devils and the New York Rangers are long eliminated from playoff contention (the first time since the Devils came to New Jersey that both teams will miss the playoffs in the same season, if you can believe that) but it was still Devils-Rangers. The Devils came away with the 4-2 victory on home ice to finally grab a win from their cross-river rivals in their final home game of the 2018-19 season. It was a physical game with a few fights. It also had some nice goals and some great saves. In some roster-related news, Jesper Bratt has officially been shut down for the season. Kurtis Gabriel (upper body) missed his third straight game, Sami Vatanen (illness) remains out and Kyle Palmieri (lower body) was also missing tonight. Egor Yakovlev was a healthy scratch. The Devils were getting Nathan Bastian back off of injured reserve tonight. He would go on to have a solid game. The goalie matchup saw Mackenzie Blackwood for the Devils (he stopped 30 of 32 shots for a .938 save percentage) get his first win over the Rangers while the old workhorse Henrik Lundqvist went for New York. He stopped 37 of 40 shots against for a .925 save percentage on the night. Special teams played a rather large role tonight. The Devils were 1-for-4 on the power play with five shots and two shorthanded shots. The Rangers were 1-for-2 with two shots. They also had two shorthanded shots. The second period saw three fights as first, Tony DeAngelo fought Bastian to a draw in the young Devils’ second career NHL scrap. In the second one, Brendan Lemieux took on Miles Wood in a fight where Wood lost his balance early and could not get set, so give that one to Claude’s kid. In the third bout of the period, Blake Coleman took on Lias Andersson in one that also went to a draw. There was definitely some fire shown out there by the youngsters, no doubt about that. The Devils got the goal scoring started when Miles Wood (who was an assist short of a Gordie Howe Hat Trick) snapped a shot over Lundqvist’s right shoulder. He got assists from Connor Carrick and Mirco Mueller. Wood had just inadvertently blocked an Andy Greene shot on the shift just prior, which shook him up. But he recovered to give the Devils the early 1-0 lead at 3:54 into the first period. The Devils doubled up their lead on the power play at 14:34. DeAngelo had gone off for tripping at 13:56, setting up a Devils man advantage and the Devils capitalized. Damon Severson wristed a shot from the point that was tipped in front by Travis Zajac to make it 2-0 Devils. Nico Hischier had the secondary assist. From there, the game started to get away from the Devils a little. First, Brett Howden scored on a 3-on-1 for the Rangers, beating Blackwood with a shot to the short side. Connor Brickley and Neal Pionk had the assists on that goal that cut the Devils lead in half at 2-1. The goal was scored at 18:40. A few seconds after that goal, the Rangers seemed to have tied it up when Chris Kreider scored. However, the Devils challenged the call on the ice, which was a good goal and the replay showed that the puck hit the post and was cleared out by Severson (who batted the puck out of midair) and never actually fully crossed the goal line. The call on the ice was reversed to no goal and the Devils retained the 2-1 lead. The total shots in the wild first period – with both teams getting 17 for a total of 34 – is the highest combined total of shots in one period for the Devils and their opponents this season. In the second period, in between the fights, Filip Chytil found time to tie the game up at two when he scored for the Rangers on the power play. Greene was serving a holding penalty and Chytil scored off of the rush, putting in a rebound after Blackwood made the initial save. The goal came at 16:36 and Vinni Lettieri and DeAngelo had the assists. And so, we headed into the final Devils home period of the season tied at two with their archrivals. It was close. Hischier hit the post on the power play midway through the frame. But it was Carrick who was the hero. At the 15:50 mark of the third, Michael McLeod dropped the puck along the left wing boards to Drew Stafford, who found Carrick cutting in behind the play. Stafford sold a shot and passed to Carrick, who snapped the puck by Lundqvist to give the Devils a 3-2 lead. The Rangers then pulled Lundqvist with about 1:33 left in the game. Kenny Agostino tried to pot one into the empty net from center ice but hit the post. Joey Anderson then skated in, gathered the rebound and put it home on the backhand to ice the game at 4-2. Agostino and Zajac were credited with the assists on the empty netter. The Devils had finally beaten the Rangers this season, keeping them from being swept for the first time since the 2014-15 season. Chytil was the game’s third star, Zajac the second with a goal and an assist and Carrick the first with an assist and the game winning goal. The Devils out shot New York 41-32 and won a whopping 67-percent of the game’s faceoffs. There was a combined 46 penalty minutes in the game with the Rangers taking 25 of them. The Devils out hit the Rangers 23-20 and had more giveaways at 10 to the Rangers’ five. The Rangers had more blocked shots (11-5) than the Devils. Individually, Severson led all skaters in time on ice with 25:21 (including 4:32 on the power play and 2:40 on the PK) while Pavel Zacha led the forwards with 20:07 total ice time (4:32 on the PP/53 seconds on the PK). Stefan Noesen led the Devils in shots on goal with seven, Coleman led in hits with four, Severson led in blocks with two and Greene led in takeaways with two. Next up, the Devils head down to Carolina on Thursday to take on the Hurricanes in the penultimate game of the season. The Canes are still fighting for their playoff lives so this game could be interesting as the Devils could play spoiler a bit. We will find out as we will have coverage for you right here on Thursday. The Devils had not lost a game when leading after two periods since before John Hynes was named head coach. According to MSG Networks, the last time it happened was March 14, 2014 when it occurred against the Florida Panthers. But there’s a first time for everything and tonight was the first time it happened in the Hynes Era. The Devils led 2-1 after two periods of play and ended up losing the game 4-2 to the Rangers at Madison Square Garden tonight. Yet more roster turnover as we begin and the Devils take more lumps. Eric Tangradi and Brandon Gignac were recalled from AHL Binghamton as John Quenneville and Stefan Noesen were both out with upper body injuries tonight. For Tangradi, it was his Devils debut as he had last played in the NHL in the 2016-17 season. For Gignac, it was the youngster’s NHL debut. Tangradi played left wing on the third line while Gignac skated on the third line also on the left side. The goaltending matchup featured the veterans rathers than the respective team’s young goalies. Cory Schneider went for the Devils, playing very well and stopping 37 of 40 shots against for a .925 save percentage on the night. Facing him was the Rangers’ Henrik Lundqvist, who recently joined Marty Brodeur as a NHL goalie to play 800 games for one team. He made 22 saves on 24 shots for a .917 save percentage. A bright spot, besides Cory Schneider, for the Devils was their power play. They finally snapped their 10 game power play drought when Will Butcher had a shot from the point tipped in by Blake Coleman with 11 seconds remaining in the first period. That one was on the power play and gave the Devils a 2-0 lead at the time. That was one of five power play shots. The Devils also had four shorthanded shots. The Devils were 1-for-2 on the power play. As for the Rangers, they were 0-for-5 as the Devils’ penalty kill was on point. New York ended up with seven shots on the man advantage but could not get one by Cory. The Devils were winless in five while the Rangers were winless in six. Something had to give. New Jersey had also been shut out in two of their last three. But a shut out was made impossible at 16:26 when Damon Severson blasted a shot by Lundqvist after he took a pass from Kenny Agostino in the first period. Agostino had curled back along the half wall to buy time and dished to Severson at the point. That made it 1-0 Devils. Michael McLeod had the secondary assist (his first NHL point – congratulations to him). The Devils had a rare 4-on-3 power play for 24 seconds when the Rangers’ Pavel Buchnevich was called for tripping Egor Yakovlev and Yakovlev was nabbed for embellishment, which made it a 4-on-4 at 17:37 of the first. New York’s Libor Hajek then took a high-sticking penalty on Agostino to put the Devils up 4-on-3 at 19:08. The first two penalties expired, making it a regular 5-on-4 power play for the Devils and that is when Coleman scored his goal to make it 2-0 Devils. Travis Zajac had the secondary assist on Coleman’s goal, Butcher had the primary. But from there, the Devils would almost run out of gas, giving up four straight to the Rangers. It began late in the second frame, at 18:22, when Ryan Strome redirected a Kevin Shattenkirk shot by Cory that just trickled through his legs. Vladislav Namestnikov had the secondary assist as the game was now 2-1 Devils. The Rangers’ second goal came just 1:29 into the third period off the stick of Hajek (his first NHL goal) and occurred when the Devils were unable to clear the puck from their own zone. Hajek then took a pass from Chris Kreider and snapped a wrist shot over Schneider’s shoulder to make it all even. Strome had the other assist on the goal. New York took the lead for the first time at the 13:25 mark of the third when Namestnikov set up shop at the top of the near faceoff circle and scored on a one-timer off of a pass from Mika Zibanejad. Brady Skjei had the secondary. Strome, who would go on to be named the game’s first star with three points, scored into an empty net when Schneider was pulled with about 1:15 left in regulation. Strome got assists from Namestnikov (who also had three points on the night) and emerging Devil killer Zibanejad. That made it 4-2 Rangers, which was our final. The Devils had been 20-0-3 this season alone when leading after two periods according to Steve Cangialosi. That streak was now ended as the Rangers came away with the victory. The Devils were out shot 41 to 24, as Cory, again, played extremely well. The Rangers won 51-percent of the game’s faceoffs but the Devils out hit them 39 to 26. The Devils also led in blocked shots with 12 to New York’s nine. The Rangers also had 15 giveaways to the Devils’ 11. Severson led all Devils skaters in time on ice with 23:45 (including 1:48 on the power play and 5:31 on the PK) while Kyle Palmieri led the forwards with 21:12 (1:25 on the PP and 3:28 on the PK). Shots were led by Palmieri, Tangradi, Blake Pietila, and Severson who all had three. Hits were led by Agostino with five. Blocks by Zajac, Tangradi, Steven Santini and Yakovlev with two each. Takeaways were led by Nick Lappin, Coleman, Tangradi, Joey Anderson and Connor Carrick with one apiece. Gignac’s stat line read: a minus-2 plus/minus rating, one shot on goal, one block and two giveaways all in 9:04 of TOI in his debut game. Next up, the real meat of the Devils’ road trip begins. They are off to Calgary to take on the Flames on Tuesday. Puck drop for that game is 9 PM Eastern and we will have a write-up for you then. Until then, please leave a comment if you like and have a great rest of the weekend. First off, I apologize for getting this up so late. I had a family function but was still able to catch the game. The Devils made a deal to send out another impending UFA, but ended up falling to the Rangers 5-2 at Madison Square Garden earlier today. New Jersey started the day with the news that defenseman Ben Lovejoy had been shipped off to the Dallas Stars in exchange for defenseman Connor Carrick and the Stars’ third round pick in this year’s Draft. Carrick, a 5-foot, 11-inch, 195-pound 24-year-old native of Orland Park, Illinois, was drafted by the Capitals in 137th overall in the fifth round of the 2012 NHL Draft and has played in 181 regular season NHL games for the Caps, the Maple Leafs and Dallas. He played for the US National Development Team and the Plymouth Whalers of the OHL before representing the US at the 2014 World Junior Championship. He had a goal and three assists for four points and 13 penalty minutes this season for Dallas. His time has been limited to only 14 games due to a foot injury suffered earlier this season. Carrick did not play in today’s game at the Rangers, but is expected to join the team by Monday for the game against the Canadiens. Marcus Johansson was a healthy scratch for the Devils today as he continues to be held out for “precautionary reasons.” As another Devils UFA with trade value, Johansson will likely be traded prior to Monday’s trade deadline. Pavel Zacha was also a scratch today, as he continues to deal with an injury. Miles Wood was back after leaving Thursday’s game with an injury after the second period. He had a three game goal-scoring streak snapped this afternoon. The Rangers are in a similar situation to the Devils and held out Kevin Hayes, Adam McQuaid and Mats Zuccarello – all unrestricted free agents that will likely be dealt to a contender as well by Monday. As for today’s game, the Devils went back to Cory Schneider in net. He stopped 29 of 33 New York shots for an .879 save percentage. The Rangers added another shot with an empty netter late in the game. For the Rangers, Alexander Georgiev made the start, stopping 19 of 21 for a .905 save percentage. Special teams saw the Rangers officially go 1-for-3 (although they scored one goal just as a penalty was expiring, with the Devils essentially shorthanded) with five shots on the power play and one on the PK. New Jersey was 0-for-2 with three power play shots and a shorthanded shot as well. The Rangers got on the board first just 4:48 into the game when, with a power play just ending (Brett Seney had gone off for boarding at 2:48), Cory made a save but could not cover the puck up. Jimmy Vesey then put in the loose puck. Pavel Buchnevich and Tony DeAngelo had the assists. The Rangers were up 1-0, stopping Cory’s shut out streak at 85:44. New York doubled their lead when Ryan Strome scored a goal that did count as a power play goal at 8:54 of the first. At 6:55, Drew Stafford was called for tripping Vladislav Namestnikov and on the ensuing man advantage, play broke down in front of the Devils’ net. Chris Kreider made a nice backhanded, no-look pass to Strome, who shoveled the puck into the open New Jersey goal mouth. Buchnevich had the secondary assist. A minute or so after the second Ranger goal, Kurtis Gabriel got into it with Brendan Smith. It was not a full fledged scrap as it ended once Gabriel lost his balance and went down, but you can appreciate just what Gabriel was trying to do to get his team fired up. Unfortunately, it was not enough as the Rangers struck again at the 14:23 mark of the first, making it 3-0. It came, once again, off of a scramble in front of the Devils’ net and saw Kreider poke home a loose puck. Vesey had the secondary assist (giving him two points in the period along with Kreider and Buchnevich) and Mika Zibanejad, who victimized the Devils last month at Prudential Center, had the primary. A scoreless second period brought us to the final frame where the Devils cut the lead to 3-1 when Kenny Agostino scored his first as a Devil. It came at the 2:20 mark of the second and occurred when a Rangers player turned the puck over, trying to clear the puck up the middle and found Agostino cruising into the slot. He beat Georgiev unassisted and the Devils seemed to be back into things. But a Brady Skjei goal at the 11:08 mark put New York up 4-1 and things started to get out of reach for the Devils. Skjei blasted a shot from the point that beat Cory cleanly off assists from Zibanejad and Kevin Shattenkirk. Following the goal, Eric Gryba and Kreider went at it, wrestling each other to the ice. The Devils would use their coach’s challenge to see if there was goaltender interference by Kreider in front, but the replay showed that there was not and the call of good goal stood. The Devils then lost their timeout, but this was one that they had to challenge for if they had even an inkling that there might have been goalie interference. Andy Greene would get the Devils back within two when he scored 1:51 later from Kyle Palmieri and Nico Hischier. Palmieri stripped a Ranger of the puck deep in the New York zone and got it to Greene, cutting in through the slot. The captain found the back of the net for his fourth of the season and made it 4-2 Rangers. The Devils would pull Schneider with about 2:30 remaining in the game and Strome would add his second of the night into an empty net to give us our final of 5-2. He scored from Namestnikov and Jesper Fast. In the end, Vesey, Strome, Kreider, Buchnevich and Zibanejad all had a multi-point game for New York. Kreider was the first star of the afternoon while Zibanejad was the second and Vesey the third. With the empty net goal, the Rangers out shot the Devils 34-21. They also won 51-percent of the game’s faceoffs and had more giveaways at 15 to the Devils’ 13. The Devils were the more physical team with 29 hits to the Rangers’ 21 and had more blocked shots at 18 to New York’s ten. Individual stats saw ice time led by Damon Severson with 25:15 (inlcuding 2:48 on the power play and 3:37 on the penalty kill). Nico Hischier edged Jesper Bratt in ice time to lead the forwards 20:48 to 20:45. Hischier logged 2:52 on the PP and 25 seconds shorthanded. Shots on goal for the Devils was led by Hischier, Palmieri, Wood and Greene who each had three. The hits category was led by BLake Coleman with six while blocked shots was led by Wood with three. Takeaways were led by Hischier, Seney, Wood, Bratt and Greene who each had one. Next up, New Jersey returns home to Prudential Center to take on the Montreal Canadiens on Monday. Connor Carrick should be in the lineup then and we will see how he does in his Devils debut. It was a good deal for the Devils, as many thought that they would only get a draft pick for Lovejoy and they, instead, not only got the pick (which they continue to stockpile) but an NHL roster player in the deal as well. We will have coverage of the Devils-Habs game for you right here on Monday. Again, any comments left below are encouraged and we really appreciate them. Be it in the playoffs, the regular season or even the preseason, the objective remains the same for New Jersey: beat the New York Rangers. And although they did not accomplish that tonight, they did play a solid game, only falling in overtime by a score of 4-3. Some news to open things as Cory Schneider is on track to be able to play a week or two into the regular season. He will be making the trip to Europe with the team, but will not play in either the preseason game against SC Bern in Switzerland or the regular season opener in Sweden against the Edmonton Oilers. The starting goaltending matchup tonight was an all-Swedish affair with Eddie Lack going for the Devils and Henrik Lundqvist starting for the Rangers. Lack would play the whole game for New Jersey, being backed up by Mackenzie Blackwood. He made 35 saves on 39 New York shots. Lundqvist played the first two periods of the game, making 14 stops on 15 shots against. Marek Mazanec relieved him in the third and made nine saves on 11 shots. The Devils had 26 total shots in the game. The game saw two fights, both involving Eric Gryba of the Devils. In the first period, he fought Matt Beleskey at the 15:44 mark. Beleskey injured his shoulder in the scrap and would not return to the game. In the third period, Gryba came to the aid of Brett Seney, who he felt had taken a dirty hit from a Ranger. Gryba ended up dropping the gloves with Cody McLeod of the Rangers. That fight occurred at the 7:33 mark of the period. After a somewhat sloppy and sluggish first period, things began to pick up in the second. The Rangers broke the scoreless tie when Steven Fogarty scored from McLeod and Neal Pionk at 3:11 of the second frame. But it only took the Devils 1:06 to get that one back. Taylor Hall forced a turnover deep in the New York zone and passed to Kyle Palmieri at the far faceoff dot. Palmieri fired a one-timer by Lundqvist to even the score at one. It was a great snipe by Palmieri and nice work on the forecheck by Hall leading to a game-tying goal. However, before the period was through, the Rangers would retake the lead when Timothy Gettinger scored at the 9:09 mark to make it 2-1 going into the final frame. Gettinger had scored on his own rebound that handcuffed Lack. He got an assist from Pionk. Pionk would finish the night with two assists for New York. The third period saw the Rangers extend their lead further just 31 second in. It came on the power play when Chris Kreider finished a 2-on-1 with Mika Zibanejad. Tony DeAngelo had the secondary assist. That goal came while John Quenneville was in the box for tripping, an infraction that occurred 19:13 into the second period. The Devils ended the night 0-for-3 on the power play while the Rangers were 1-for-2. The Devils were down 3-1, but not out. From here, it really became the Palmieri-Hischier-Hall show. This began at the 6:11 mark of the third when Sami Vatanen found Palmieri with a stretch pass at the Rangers’ blue line. Palmieri spun around and dropped a nice feed to Nico Hischier at the top of the far faceoff circle. He fired one by Mazanec’s stick side to make it 3-2. The Devils would complete the comeback at the 9:08 mark when Hall found twine to tie it at three. It began when Hischier gave to Palmieri to break out of the Devils zone from just inside their blue line. At this point, Hall was just coming off the bench and used his speed to catch up to the play just inside the Rangers’ blue line. He took a pass from Palmieri and scored from almost the exact same spot Hischier did. That would tie up the game and Hall finished the night with two points (a goal and an assist), Hischier with two (a goal and an assist) and Palmieri with three (a goal and two assists). Hall would be named the game’s third star while Palmieri was the second. When time ran out on regulation, that led us to another Devils-Rangers preseason OT game. And it was full of excitement. Hall broke in a few times using his speed to go in alone against Mazanec, only for the Rangers’ goalie to stop him. Hischier hit the post on a chance late in overtime. But, in the end, it was a nice offensive play by the Rangers’ netminder that ended it. Mazanec caught the Devils in a change and passed the puck up to Kevin Hayes, who waited patiently in front of the Devils’ net until he found Vinni Lettieri. Lettieri went upstairs to seemingly beat Lack but the goal was initially waved off on the ice. The officials conferred and replays showed that it did go just under the crossbar, beating Lack cleanly. The call on the ice was overturned, it was a good goal and the Rangers had the 4-3 win. That one came at the 3:53 mark of the overtime period. Overall, the Devils played a good game, really pressuring the Rangers late in the game and getting some good chances out of it. Vatanen led all skaters in ice time with 25:38 – including 2:31 of power play time and 1:01 of penalty killing. Hischier led the forwards with 19:35 – with 3:23 of power play and 1:06 penalty kill. Shots on goal were led by Hall, Brian Boyle, Jesper Bratt, Vatanen and Ty Smith who each had three apiece. Quenneville led in hits with four while Gryba and Vatanen each registered two blocks. Next up, New Jersey travels to Winnipeg on Thursday to take on the Jets. Although this game will not be televised in the New York City market, I will try to get a post up with details about the game as best I can. As many of you are aware, hockey season kicks off tomorrow for the Devils. New Jersey will be playing a pair of split squad games, one at home against the New York Rangers that begins at 7 PM and one up in Montreal against the Canadiens that starts at 7:30 PM. The Rangers game is being televised on NHL Network outside of the New York metropolitan area and locally on MSG+. 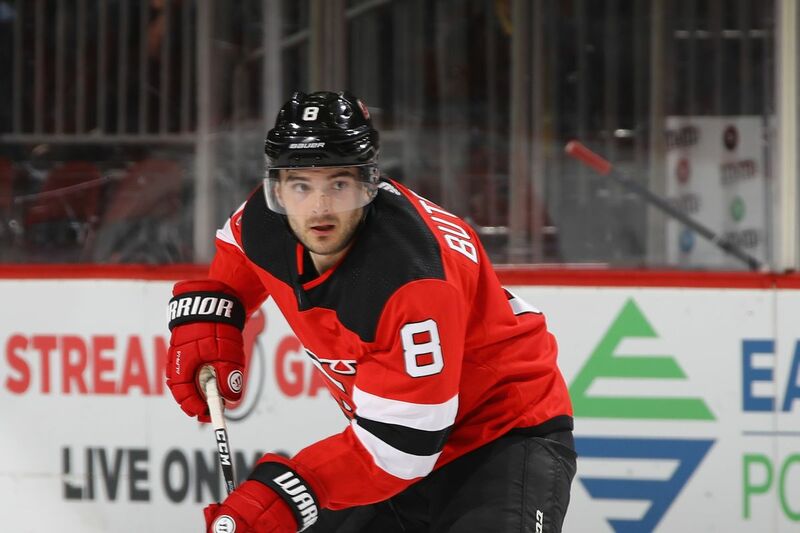 For the game at Prudential Center versus New York, the forwards will consist of Brian Boyle, Jesper Bratt, Kurtis Gabriel, Taylor Hall, Nico Hischier, Nick Lappin, Michael McLeod, Stefan Noesen, Blake Pietila, John Quenneville, Kevin Rooney and Eric Tangradi with Yegor Sharangovich as a healthy scratch. The defense corps for the Ranger game will be: captain Andy Greene, free agent pick-up Eric Gryba, Steve Santini, 2018 first round pick Ty Smith, Sami Vatanen and Egor Yakovlev. Colby Sissons will be available but will not likely dress. The goalies will be Keith Kinkaid and Cam Johnson. For the game in Quebec, Joey Anderson, Brandon Baddock, Blake Coleman, Brandon Gignac, Marcus Johansson, Kyle Palmieri, Brett Seney, Blake Speers, Drew Stafford, Marian Studenic, Pavel Zacha and Travis Zajac will play up front with Nate Bastian as an extra. The defense in Montreal will be Will Butcher, Josh Jacobs, Ben Lovejoy, Mirco Mueller, Damon Severson and Brian Strait. Xavier Bernard will be on the trip but likely will not dress. The goalies for the Habs game will be Eddie Lack and Mackenzie Blackwood. This information comes from the Devils’ official website. We will, of course, have coverage of the Devils-Rangers game here and will try to do something with the information we can get on the Devils-Canadiens game, too. The push to the playoffs is coming down to the wire and the Devils are looking better and better with each passing game. Tonight they defeated their cross-river rivals 5-2 to move their magic number to clinch to just two. They would not clinch tonight, as Florida beat Nashville 2-1 in regulation to keep their hopes alive, but they did leapfrog the Flyers as Philly lost to the Islanders 5-4 in Brooklyn. They did not leap over the Blue Jackets either, as they beat the Red Wings in OT 5-4 in Ohio. This was the second to last home game of the year for the Devils, they do have Toronto at home on Thursday, but this one was a big one against a rival with so much at stake for New Jersey. Some roster moves first. The Devils scratched Jesper Bratt tonight with Brian Gibbons slotting back in at forward. Jimmy Hayes, Marcus Johansson and Drew Stafford were also out with Damon Severson scratched on defense. The D would remain the same with Severson out and Lovejoy in. The lines were shaken up a little bit with Taylor Hall, Nico Hischier and Kyle Palmieri were the top line combination and Pavel Zacha, Michael Grabner and Patrick Maroon rounding out the top six. The goaltending matchup saw Keith Kinkaid, who tonight became the winningest goalie in the NHL since February 15 go against Rangers veteran Henrik Lundqvist. It was a relatively light night for Kinkaid, as he stopped 22 of 24 Ranger shots. Lundqvist, however, was under siege most of the night. He made 39 saves on 44 Devils shots. This is uncharted territory for Lundqvist, who is playing meaningless hockey for the first time in his career. The Rangers are set to miss the playoffs for only the second time since 2005-06 and Lundqvist was on the team in 2010 that missed on the final game of the season – a shootout loss in Philly. The Devils got the most from their power play tonight too. They went an amazing 3-for-4, scoring on four power play shots. The Rangers went 0-for-2 with a single shot with the man advantage. The Devils had won three of four games against the Blueshirts this year and were gunning for the fourth of five. They would not waste time in getting there. Just 25 seconds into the game, Travos Zajac scored from Blake Coleman to make it 1-0. The Devils broke into the New York zone on a 2-on-1. Zajac dropped to Coleman, who was trailing as the Ranger backchecker was getting back quickly. Coleman got a shot off as he was falling to the ice. Lundqvist made a good save to stop him, but Zajac was right there to tap in the rebound as Lundqvist had come way too far out of his crease. The Devils had their foot on the gas and they would not let up. The Rangers were given a too many men on the ice bench minor at 3:14 of the first and the Devils were on their first power play of the night. Taylor Hall would take it from there. Will Butcher, at the point, passed to Kyle Palmieri down low. He one-touched to Maroon at the doorstep. Lunqvist made the save there, but the rebound jumped out to Hall stationed at the far faceoff dot. He shot and beat Lundqvist to make it 2-0. The goal came at 3:41 of the first and was scored unassisted, but I believe that at least Butcher was given an assist later, as I think he would end the night with a goal and two assists. Although Palmieri and Maroon would make more sense as the two assists. The Devils would make it 3-0 at 10:40 of the first. That one came on the power play also as John Gilmour was called for delay of game for shooting the puck over the glass. Butcher scored from Palmieri and Hall to convert there. Hall weaved in the far corner to alieviate pressure before finding Palmieri at the far point. He faked a shot and went point-to-point with Butcher, who ripped a one-timer towards goal that beat Lundqvist for the Devils’ third goal of the young contest. The Rangers would push play a little bit towards the end of the first, finally breaking through when Ryan Spooner scored from Jimmy Vesey and Filip Chytil at 17:47 to make it 3-1. The second period would belong to New Jersey, however. Butcher scored again on the power play at 6:53 of the second from Hall and Zajac while New York’s Ryan Sproul was off for high sticking. Hall skated down the left wing and dropped for Butcher at the near point. He unleashed one, beating Lundqvist again to make it 4-1 Devils. This was Butcher’s first career NHL multi-point game and pushed him past Slava Fetisov for most points by a Devils’ defenseman in their rookie season with 44. A scary moment while the Devils were killing off a penalty midway through the second period. A Pavel Buchnevich one-time shot hit Kinkaid square in the mask and knocked it off. He would get his backup mask and continue on. At the 15:45 mark of the second, Taylor Hall was hauled down on a breakaway by Rangers d-man Brady Skjei. The referee’s arm went up and fans did not know if it was a tripping minor or a penalty shot. It was a penalty shot to be taken by Hall. He skated in and went high over Lundqvist’s glove, converting and making it 5-1 Devils. With that goal, Hall moved past Anze Kopitar of the Kings and into a top six spot in the NHL scoring race. He would hear chants of “M-V-P” from then until he came out for his TV interview after being named the game’s first star. Midway through the third, Brian Boyle and Vesey would drop the gloves but would not fight. Linesman Tony Sericolo jumped in and the two were only assessed matching roughing minors instead. New York would score one more at 14:26 of the third when Kevin Hayes took a giveaway in front of the Devils net and scored unassisted to make it 5-2. But the Devils had this one in hand with a 5-2 victory. Statistically, John Moore led the Devils in ice time with 21:23 (including 1:17 on the power play and 52 seconds on the PK) just edging out Sami Vatanen, who had 21:06 of TOI. On a night when every Devil registered a shot on goal except for Andy Greene, Hall and Lovejoy tied for the lead with five each. Stefan Noesen and Moore both had two hits to lead in that category, Lovejoy had two blocked shots and Zajac had three takeaways to lead there. Team-wise, the Devils won 58-percent of the game’s faceoffs, outshot New York an impressive 44-24. They were out hit 23-8 and the Rangers had more blocks, 12 to 9. Next up, the Devils take on the Toronto Maple Leafs at home. Again, the magic number is two – either two points gained by the Devils or lost by the Panthers will get them in. Florida also plays on Thursday, at home agaisnt the Bruins. Hopefully everything will shake down in the Devils favor and we can begin to talk about potential first round matchups. Note: if you enjoyed this post, please feel free to inreract with us. Follow us on Twitter @LGDevilsNet, email us at LetsGoDevilsNet@gmail.com or simply leave a comment below the article. It took 35 years, but the New York Rangers finally made a deal with the Devils. The Devils tonight acquired forward Michael Grabner from New York in exchange for a second round pick in the 2018 Draft and the rights to Yegor Rykov, a defenseman (picked in the fifth round, 132nd overall, in the 2016 Draft) currently playing for SKA St. Petersburg of the KHL. According to the Devils’ press release, GM Ray Shero made the announcement that the 30-year-old Grabner had been secured. He has 25 goals and 31 points in 59 games this season with his goal output leading the Rangers and his points ranking fourth. He is playing in his ninth NHL season (played with Vancouver, the Islanders, Toronto and the Rangers – he now makes the metropolitan area trifecta having played for the Isles, Rangers and Devils). The 6-foot, 1-inch, 190 pound native of Villach, Austria was Vancouver’s first pick (14th overall) in the 2006 Draft. He has 156 goals and a total of 244 points in 532 NHL career games. He also has 92 penalty minutes and is in the final season of a two-year contract according to the press release. He will make $1.65 million this season. Although he is likely a rental for the playoff push at this rate and Shero has said in the past that he would gladly make deals with the Rangers if it improved the team, this is still a little bit jarring. It is great to have a player like Grabner on board as he will add scoring on a team that has not been getting much of it consistently outside of Taylor Hall. The big question is Rykov. He is a good prospect, but if he never comes over from Russia, the Devils will not have lost much. If he does, then…. Either way, the Devils have some help for the playoff push and history has certainly been made. I do not think that this will become a habit, but I do think that both teams will benefit from it – especially if the Devils make the postseason.